Kauhola Point has been used as a gathering place since ancient times. King Kamehameha I used the land as a place of respite after times of war—a place where he could focus on family, recreation, and agriculture. Local lore even tells of him teaching his wife Ka`ahumanu how to surf in the waters of Maliu offshore. Today, families in North Kohala enjoy fishing, swimming, and surfing on the property, which local school children in Malama Kai Foundation's Ocean Warriors Program also use as an outdoor classroom for marine educational programs. Local educators also have plans to use the area for on-site agriculture, native reforestation, and shorebird rehabilitation programs. 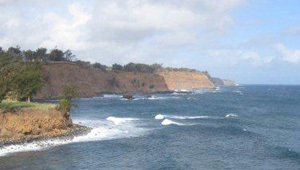 In April 2012, The Trust for Public Land purchased the 27.5 acre Kauhola Point property and transferred it to the nonprofit community organization Maika'i Kamakani 'O Kohala, Inc., which will preserve the undeveloped open viewplane, maintain access for cultural and recreational purposes, and steward the property's cultural sites.